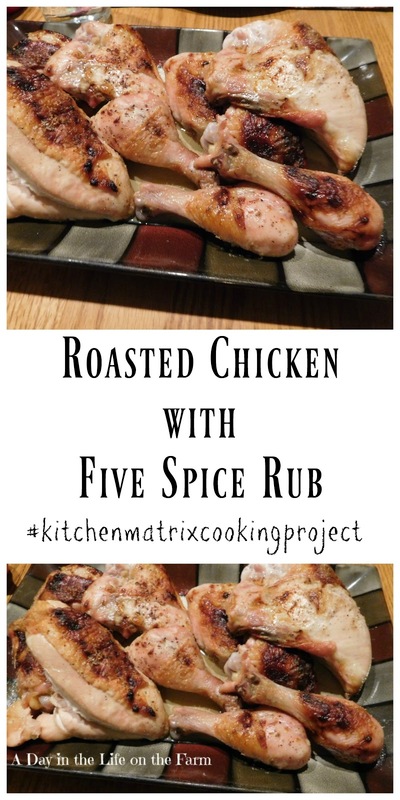 We're into our second week of the second month of the Kitchen Matrix Cooking Project, the brainchild of Cam who writes over at Culinary Adventures with Camilla. Cam invites those who would like to join her to cook their way through Mark Bittman's Cookbook for a year. Well, nearly eleven months if you decide to join us now. Each week we get inspired by a different section of the Kitchen Matrix. You can learn all about it and find out how to join in the fun by stopping in and reading Cam's Information Post. This month, I have chosen the sections from which to cook. You can follow the directions provided or use the cookbook as Bittman intended and just be inspired by all the different combination possibilities. I asked the group to take their inspiration from the Roasted Chicken Pieces, section of the book. I decided to make a Chinese Roasted Chicken. I changed up the ingredients in the rub a bit and was very pleased with the results. I made a paste of Five Spice Powder, garlic, ginger, and lemon grass. I rubbed this underneath the skin of the chicken and then drizzled it with a little olive oil before placing it in the oven. Easy peasy and delicious....the perfect recipe!! It was such a perfect dish to go with Asian flavors, wasn't it?!?! I love this. I love the substitution of the lemon grass. Very nice!